After the U.S. women’s gymnastics team won gold Tuesday, the National Anthem was played. 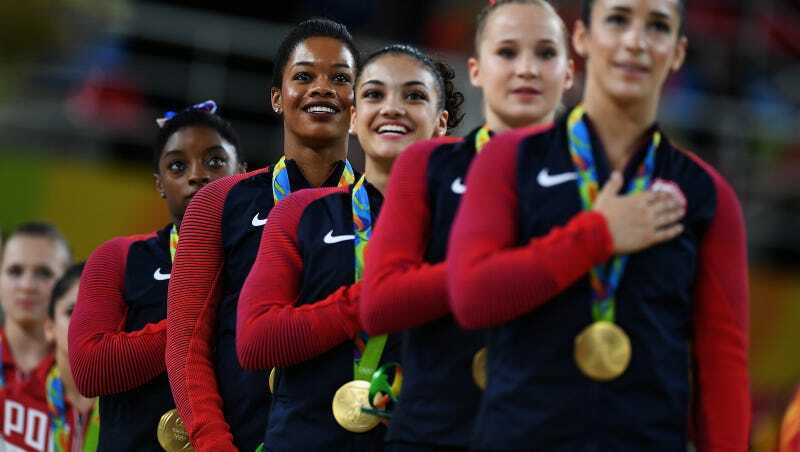 The girls lined up and listened, but for some reason, or perhaps no reason, Gabby Douglas didn’t put her hand over her heart. Does she even care about America? Twitter was quickly flooded with comments from people who have never done a back flip for their country in their life, criticizing Douglas for what they saw as blatant disrespect for the U.S. of A. The National Anthem often seems confused with the Pledge of Allegiance, but either way, Douglas wasn’t committing treason. Perhaps she was just reflecting on her continued success on behalf of her homeland? In response to a few tweets I saw tonight, I always stand at attention out of respect for our country whenever the national anthem is played. I never meant any disrespect and apologize if I offended anyone. I’m so overwhelmed at what out team accomplished today and overjoyed that we were able to bring home another gold for our country!